By Justin Jones — Manhattan, NY – If there was any doubt surrounding Miguel Cotto’s (39-4, 32 KOs) future hall of fame status, or uncertainty about who his signature victory would be against–as all the greats possess–last night’s stoppage of former middleweight kingpin Sergio Martinez (51-3-2, 28 KOs) was it ladies and gentleman. Cotto proved to truly be Puerto Rico’s finest as he became the island’s first boxer to ever win a title in four different weight classes. What’s more impressive about the dominating performance is that he achieved the historic feat at Madison Square Garden (MSG), the world’s most famous arena, in front of a packed house of more than 20,000–the majority of them consisting of prideful and supportive fellow Puerto Ricans. Keep in mind he did this against one of the top pound-for-pound fighters in the world previously, and on the eve of the Puerto Rican Day parade. Most of all and frankly, the fight wasn’t even close. Despite Martinez being labeled as the heavy favorite due to his superior measurables and athleticism, Cotto’s speed, power, aggressiveness, accuracy, and movement was like a high level sudoku problem that Martinez just couldn’t solve. Everything Cotto landed with seemed to hurt Martinez and he made the Argentinian look every bit of 39-years old in the ring as he knocked Martinez down a total of four times during the bout before it was finally halted just seconds into the 10th round. What’s next for both fighters at the moment looks completely different for the two men as the dust begins to settle. Cotto on one hand has the boxing world in his hands as he dons the new WBC Middleweight strap and is without a doubt the lineal champ. He can now name his opponent and his price, as well as his site, which anywhere other than MSG would be baffling. By essentially going all in with the Martinez fight, Cotto got the hand he needed, doubled up his chips so to speak, and now he holds the biggest stack. As for Martinez, he really needs to do some deep thinking as to whether or not he wants to continue fighting, as not only his knee seems to be failing him, but also his chin as of late. Martinez has now been down in his last four fights including this bout, and unlike the prior three, he wasn’t able to pick himself off the canvas and come out with the win. With all the of the hype surrounding the fight, the actual showdown proved to beyond belief or our imagination. 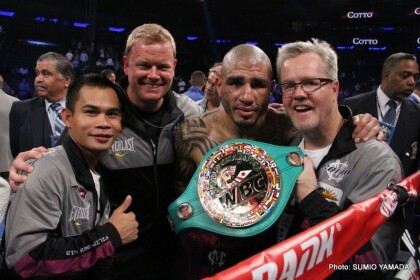 Cotto with hall-of-fame trainer Freddie Roach by his side seems to a whole different person in the ring. Roach has Cotto looking like a boxer we’ve never seen before, or at the very least an updated version…Cotto 2.0 shall we say. Whatever you want to call Cotto just make sure you add champ in the same breath, because he took on the challenge, proved most of of the boxing world wrong, and not only does he have Puerto Rico’s attention, but the world’s too once again.